Register Log In ECN Forum Forums General Discussion Area 3 Phase Delta - Neutral required? Customer wants to be able to cross connect between 2 1000 A 3 phase, 480 V generators to be able to operate in case of catastrophic generator failure. All load are 3 phase delta connected. 200HP load is softstart. Is there any requirement to carry a neutral conductor(s) (NEC or MSHA), or can I just carry 3 conductors and EGC? I assume you mean they have 3 way 3 phase transfer equipment. If this is corner grounded I don't see a reason to even have a "neutral" from either generator it is one of the phases. The service grounding point (MBJ) and the corner ground in each generator would suffice to ground the service. In fact if this is corner ground and you "float" the generator bond, you could bolt the grounded phase (white wire) and use 2 pole transfer equipment. You say there is no need for the neutral but how are the generators wired? Y or Delta? IF they are connected internally Y then you must take the neutral at least to the main disconnecting means and ground it or you will have issues in a fault. After the main switch the bonding system will carry fault back to the ground point to operate the protection. Without a star point then the ground is more like bonding and a ground fault detector must be installed somewhere appropriate. I have not covered a lot of the details regarding the transfer switch and whether a 4 or 3 pole transfer switch 1 or 2 electrode systems, open or closed transition transfer switches etc. You only need GF protection if this is ungrounded. I was assuming corner or center tap ground since he said delta. Corner ground scares people but in a lot of cases it is the simplest way to go if you are not serving L/N loads. Wye is just handy because of the resulting 277. We're well beyond the scope of the NEC here; perhaps the answer is best found in an NESC forum. After all, with two generators, how can you monitor for phase loss? I suspect the customer lacks faith in nhis PoCo because of power quality issues. In this day of varieble frequency drives, induction heating, UPS systems, fluorescent lighting, etc ... I am personally of the opinion that delta systems in general, and ungrounded deltas in particular, is long gone. The guy is experiencing voltage swings because .. he is creating them! I'm not clear on the theory, but it appears that the neutral of a wye system does far more than just give you 277v lighting. Full disclosure is in order here. My employer. based in part on my opinion, has committed millions to convert part of out facility from ungrounded delta to grounded wye. Talk to me in two years - I'll either be the smartes kid in town, or unemployed! Because of all of the issues triggered by sub-system faults. Faults like bad motor capacitors, bad windings in either transformers or motors can produce astonishing voltage peaks in ungrounded systems. Now that Congress has legislated high efficiency solid-state switching devices ( electronic ballasts ) and VFD's are going everywhere grounded systems are the only way to go. I hate ungrounded control circuits. The back-EMF swings of full voltage contactor logic all too often trigger chatter. If you need a reference neutral for an ungrounded delta think in terms of a zig-zag transformer with controlled impedance. In which case, I'd have it engineered. As my colleagues have stated. Ungrounded systems are fraught with hazards. It is far more common to find that industrial sites are using resistive or impedance grounded systems. The have the advantage of tolerating ground faults long enough to isolate them and fix them without all the voltage and insulation issues associated with a ground fault on an ungrounded system. In Canada our industrial voltage is 600 instead of 480 which puts even more stress on an ungrounded system. in normal operation a balanced 600 volt delta service floats around 347 volts to ground but if any phase grounds the voltage is now 600 in the other 2 ungrounded conductors which puts a bigger stress on all the components and insulation. I don't think we have been told this was an ungrounded system, only that they did not extend a neutral conductor. Back in the glass house computer room days they never extended the neutral beyond the service disconnect or secondary of the transformer and these were usually wye systems. The only time you really need to extend the grounded conductor is in a corner delta and that is because it is one of the phases, albeit a "white" one. The others can stop at the main bonding jumper. In a nutshell, if the connected loads do not require a Circuit which includes the System Grounded Conductor (there are no L-N Loads), the Grounded Conductor is not required to be brought past the point of initial Bonding to the GES (Grounding Electrode System). From what I am interpreting this topic, it appears your Client has (2) 480Y/277V, 750KW Generators. or will One of the Two Genny be kept stand-by + isolated until needed? I think I have an idea of the System Transfer action planned. The Switchgear has (or will have) a section with a Manual Transfer Switch, and the Genny(s) connect to the gear via cords? Anyhow, If there will be any L-N (277V) loads to be driven when the System is powered by the Gennys - such as during utility outages, then bring the Star-Point Common Grounded Conductor to the Gear, along with the (3) Ungrounded Conductors + an EGC. If the Gennys ("Generators") are Delta Connected, there will not be a "Neutral"; only a Grounded Conductor (if Corner Grounded), or a Center Tap. In the case of the Corner Grounded Delta, definitely bring the Grounded Conductor - as it will be Phase "B". If Center Tapped, bring all (3) Ungrounded Conductors, along with an EGC bonded to the Center Tap + GES. 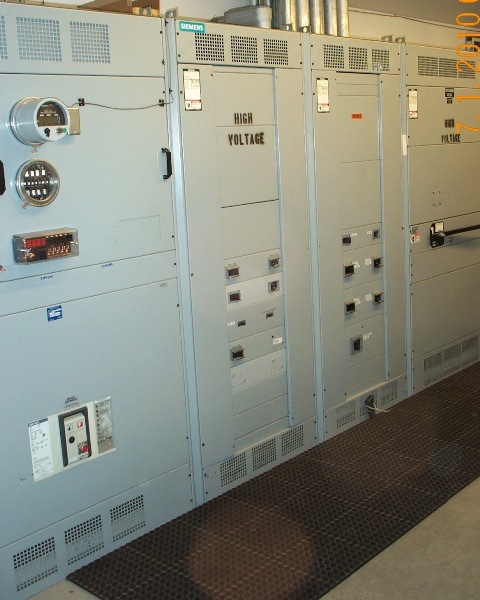 I attached Two Images of Switchgear containing a MTS (Manual Transfer Switch) + Genny Cord Whips, for reference. Let us know the details and such. All my loads are Delta - no L-N loads. No utility power - I have a couple of dry transformers for power when the gensets are off at night - manual transfer switches to connect those loads to PoCo. No corner grounds either. 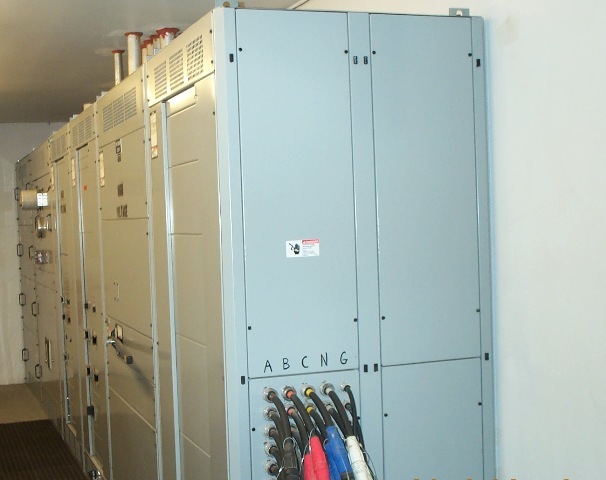 One genset feeds a SquareD panelboard; the other feeds an A-B MCC.